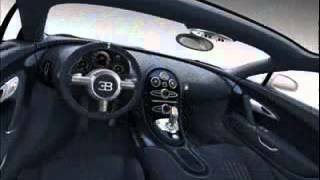 Bugatti presented the Bugatti Veyron16.4 Grand Sport Vitesse for the first time to the South American market at the Sao Paulo Motor Show 2012 in Brazil. The one-off edition supercar is called the Bugatti Veyron Grand Sport Vitesse Rafale. This car costs 1.9 million Euros, whereas the base price of the Vitesse lays at 1.69 million Euros (without tax and transportation). Major parts of the upper area of the body are finished in the light “Gris Rafale”, while the roof area, air scoops, air brake and some parts of the back are in blue visible carbon. This strong contrast of colours is found again in the interior but vice-versa: with lake blue leather seats and a stitching in light grey. The Rafale boasts a remarkable maximum torque of 1,500 Nm (at 3,000–5,000 rpm) from the 7.9-liter capacity of its W16 engine. This allows the car to reach 100 km/h (62 mph) in unbelievable 2.6 seconds. The top speed of 410 km/h (255 mph) makes the four-wheel drive Vitesse (like all Veyrons) the fastest production roadster ever.